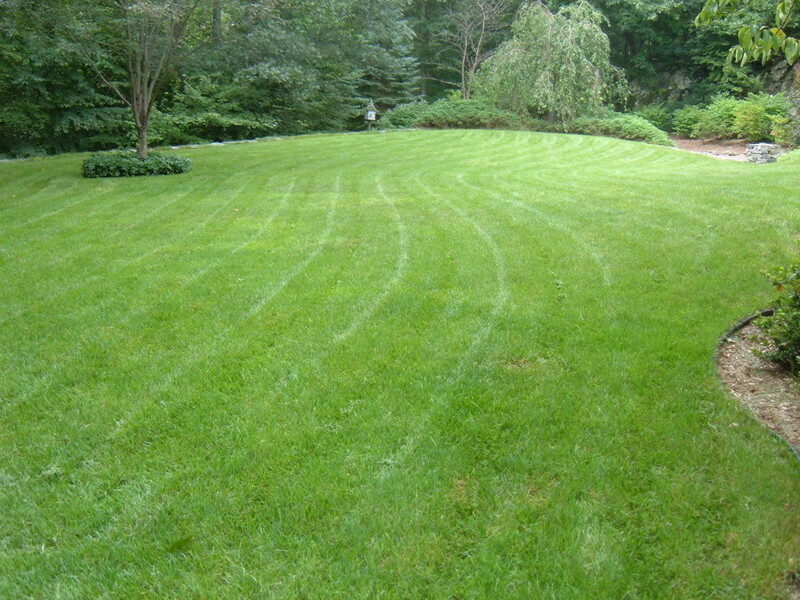 Ideas for a beautiful backyard that you can do yourself for minimal cost. 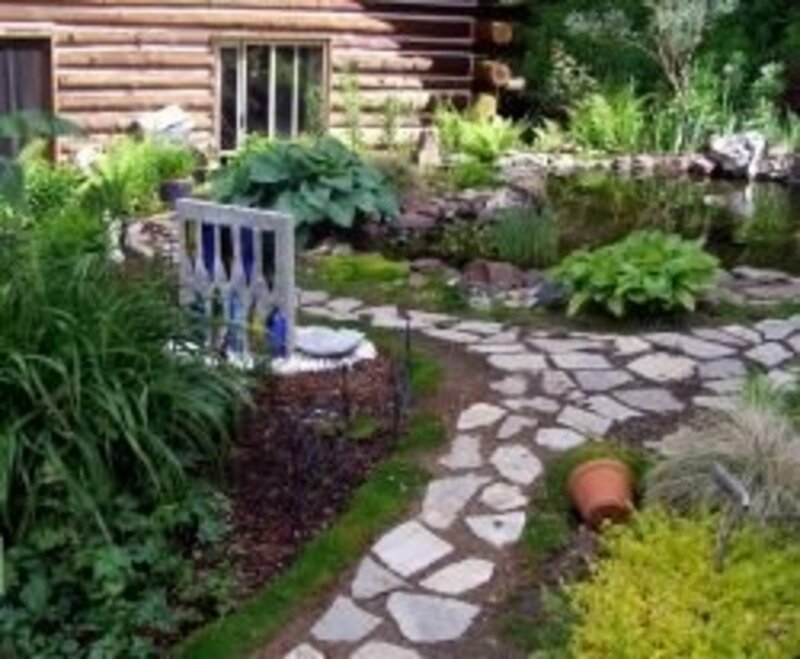 Create pathways, ponds, patios and decks. Plant with beautiful flowers and shrubs to create any mood that fits your personality and suits your mood..
All photos in this lens are from my own garden. Enjoy! One of my favorite hobbies is to build fish ponds. Anyone can build one. My property is not on water so I chose to bring water to me. First I decided where I wanted my pond to be, then got my shovel and started digging. Pond supply stores carry all the necessary parts, liners and pipes. Many books are available to assist a beginner. And be sure to check out YouTube. Be aware, however, it can become an obsession. One pond leads to fish, then bigger fish require yet another pond. There is still plenty of room on my property for more ponds, but they do require more maintenance than I choose to spend on more than two bodies of water. Once the fish in my pond began attracting the local heron I had to make a decision. If I were to keep Koi I would need a pond that couldn't be accessed by herons. The result was this 5 foot deep pond with straight sides. This prevented the heron from gaining any foothold, therefore keeping the Koi safe. I replaced my vegetable garden with a new "outdoor room." It includes a fire pit for evening enjoyment but is the last place the sun is shining on my backyard. To complete the serenity the sound of running water was required so I built this small water feature. It is simply a plastic container buried in a small hole in the ground to circulate the water. After placing a wire over the top of the container, I placed river rock over the area so the water appears to just disappear into the ground. Simple and soothing, day or night. Whether you decide to build a garden pond yourself or hire a professional, the following video is packed with ideas and inspiration. Notice various aspects such as what kind of rocks were used, how the area is planted with foliage. Whether your pond is small or large many ideas in this video can be incorporated in your project. It is a beautiful video. Enjoy! Check out my other hub on building ponds and waterfalls. My backyard has been created truly on a budget. I live on several acres of trees and have an abundance of natural materials available to me. Ideas come to me as I work on my landscape. Working on my backyard landscaping ideas is my most favorite thing in the whole wide world. It has become a living palette of color and form. All photos in my lenses are actual pictures of my own backyard creations. Twigs and branches make lovely arbors and fences. Twisted branches can be screwed together for a unique bench. 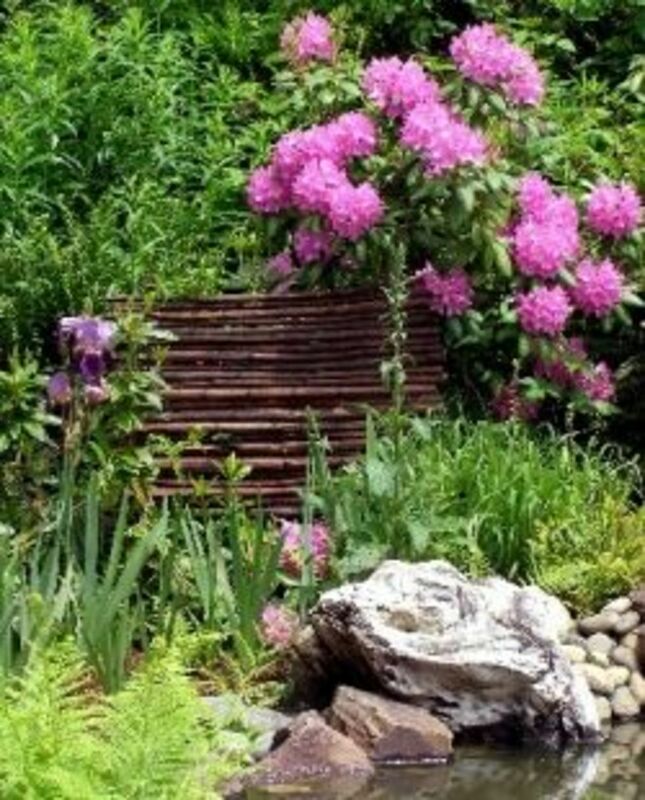 Rocks can be gathered to form original rock gardens. Although I have two ponds, there was no place comfortable to sit beside one of them. Digging back a flower bed and constructing a cement patio made with a template purchased at Home Depot solved this problem. Now it has become a favorite place to contemplate nature and life. 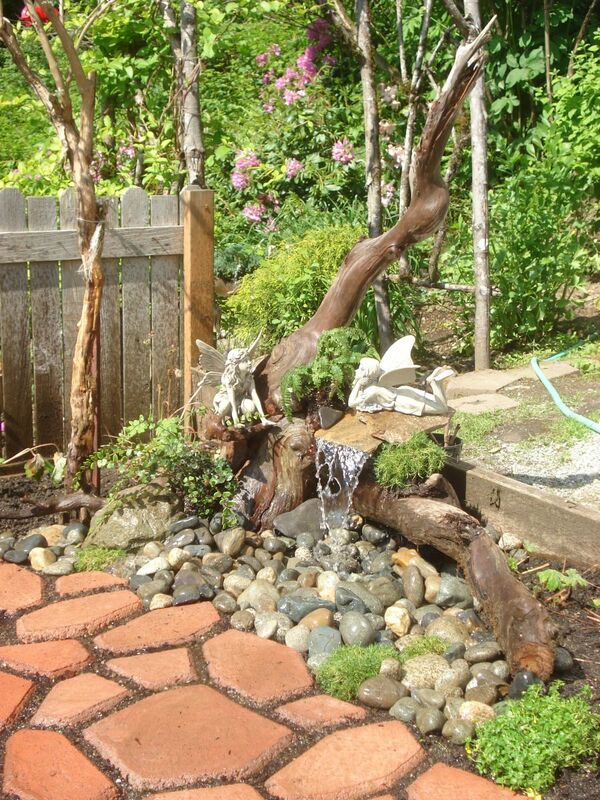 A spectacular garden space can easily be created with very little money and some imagination. With plant life, nature does most of the work. Every garden needs a variety of places where one can sit and enjoy the surrounding fragrance, form and sound. When the environment is in harmony it is much easier to meditate and reflect upon nature and life. Carving out spaces in my backyard garden provides seating for quiet thought. Each little room is surrounded by different form and sights. As my waterfalls and streams ripple, the sweet notes of birds enter into the symphony of sounds and I become one with nature. This book serves as a source of inspiration for me. There's nothing more that feeds my soul than connecting with nature in an outside setting where I can sit and reflect or simply just BE. Many creatures compose my backyard ecology. This is a very useful "garden vacuum cleaner." 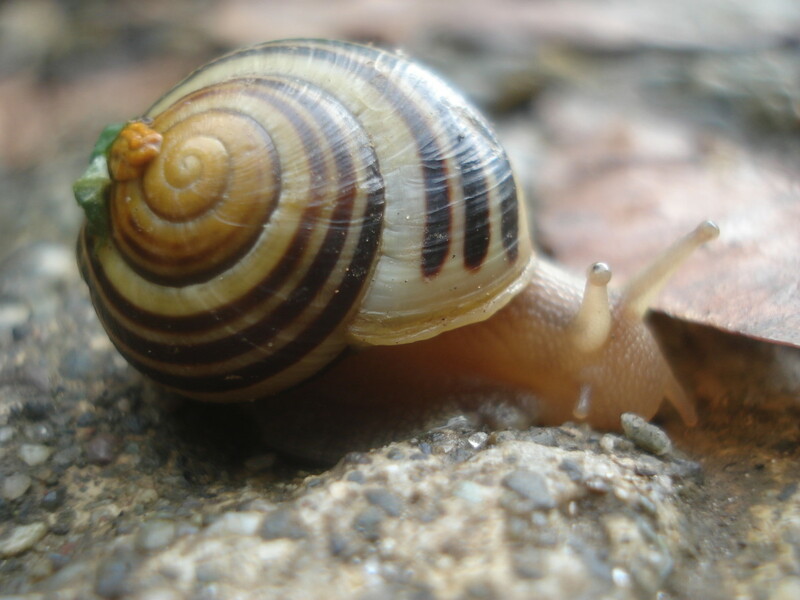 They are prevalent in my backyard hideaway as well as a variety of slugs that also work to keep the floor of my garden clean. Slugs and snails also clean up after my dog and prevents the accidental "step in pooh." 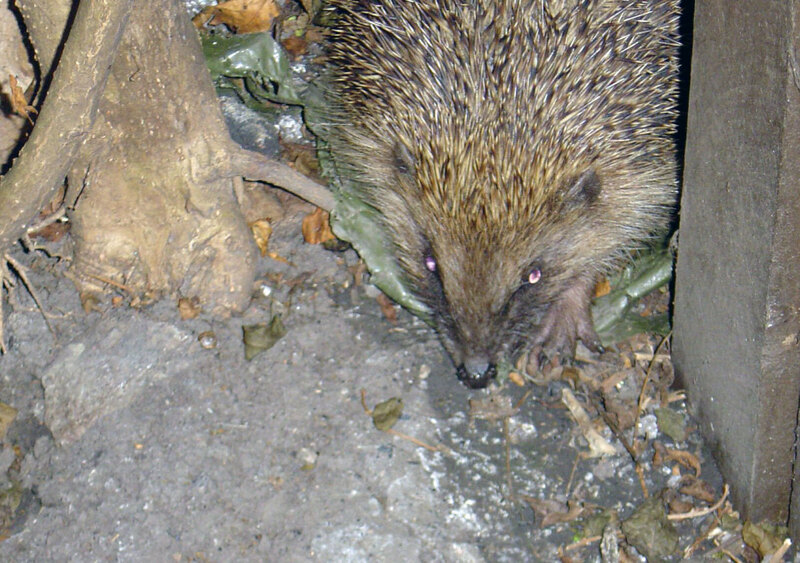 I am very grateful to these little creatures for the part they play in my garden. 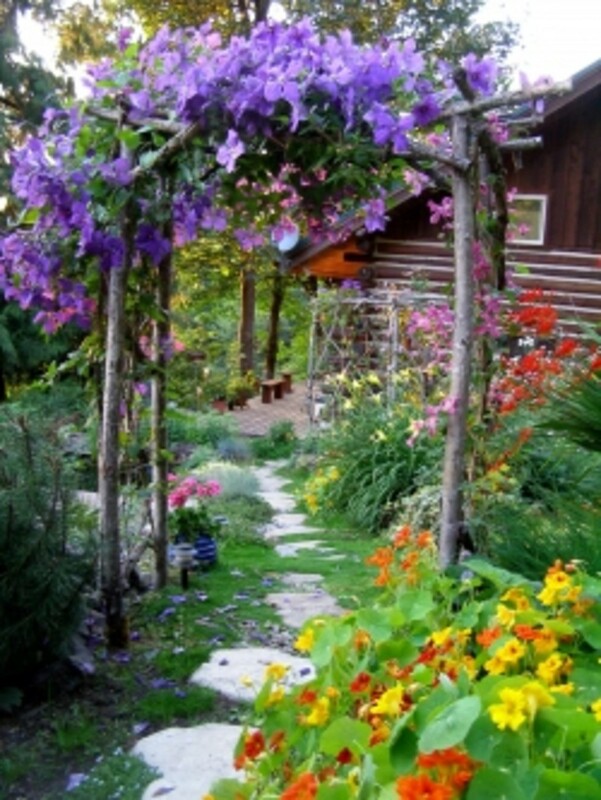 No backyard landscape is complete without color that flowers offer. Plant an individual spectacular species or groups of magical color. Each year, I change color schemes and plant accordingly. I find many choice plants on the sale table at local nurseries. I call them my rescue plants. At a local home improvement store, I found very inexpensive slate pieces that made a lovely pathway. One method I used is free form stepping stones made from Quikrete. Simply mix a bag of concrete with water in a wheelbarrow or large bucket. When slightly softer than cookie dough, shovel a pile onto your pathway and using a trowel, form the shape you desire. It''s easy. A bag of concrete mix will make 2 free form stepping stones. These can be left natural or colored with concrete tint. On my property we find wild bamboo. It is quite invasive but I found a creative use for it. Cut several stalks, screwed them to upright 1 X 2s, stained them dark brown. Voila, a fence to add interest. Planted a flowering shrub beside it and it became an outstanding addition to my garden. This was my first attempt at conquering Rock Balancing or Rock Stacking. It is said anyone can do this and I believe this is true. It was also very obvious during the creation that it was a TOTAL exercise in patience. Once the rock is rotated and moved over and over again, it find its spot and balances easily in place. Once that is accomplished, gravity takes over and it remains through wind and rain. I built this one in my pond to protect it from my dog who is not fond of water. Check out Youtube videos on rock balancing and give it a try. 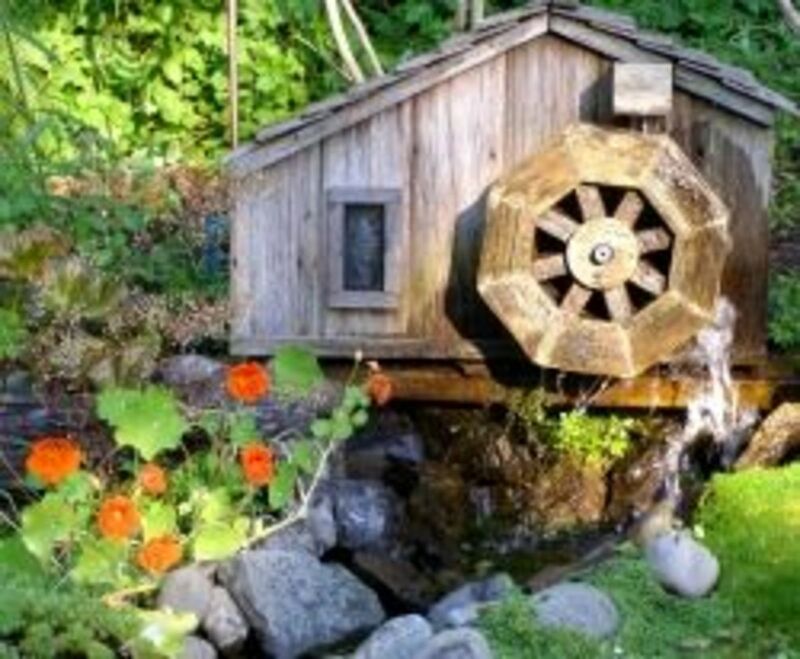 This darling waterwheel house was made by my brother. It adds quaint charm to my garden and the falling of the water falling from the wheel adds new sound. I dug a stream which I lined with pond liner and rocks. It empties into one of my ponds and recirculates. If you have no pond, simply dig a small hole, line with rubber liner and circulate the water with a small pump. 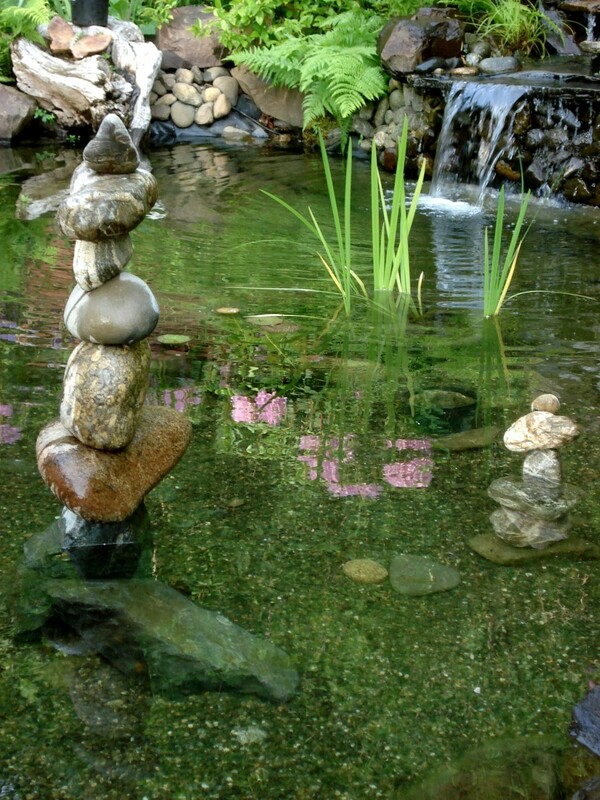 Instead of an open pond, fill the "pond" with rocks. The water still exists, but no open water or mosquitoes. The contrast of the wood to the greenery surrounding it adds eye appeal. Even my animals appreciate the garden. As new flowers bloom, they take interest. The blue star creeper wanders comfortably among the hosta and dianthus. Breedle walks carefully on the rocks so as not to harm the flowers. As the forests begin to receive a blanket of snow and darkness, the critters are skittling over the landscape. The night creatures are beginning to stir. Their day is just beginning and the hunt is on for survival food. The bats grasp what insects they can and the possums are scurrying across fields in search of prey. Where does one begin to describe the beauty of the forest whether in daylight or darkness and covered by snow. Each creature has his place in the scheme of planet earth and the amazing feats of fun and survival go unnoticed by most. It is a patchwork of industry and cunning. Now we begin to acclimate ourselves to the classic gray sky that predominates the north western winters. It is a time of pondering and reflection and preparation for the growth and activity ushered in by spring. For now, there is nothing to do but hunker down for longer nights and enjoy fireside light and conversation. Although my backyard is still currently asleep for the winter, thoughts of spring are creeping into my consciousness. I look forward to the new chapter of my life that will arrive with spring. 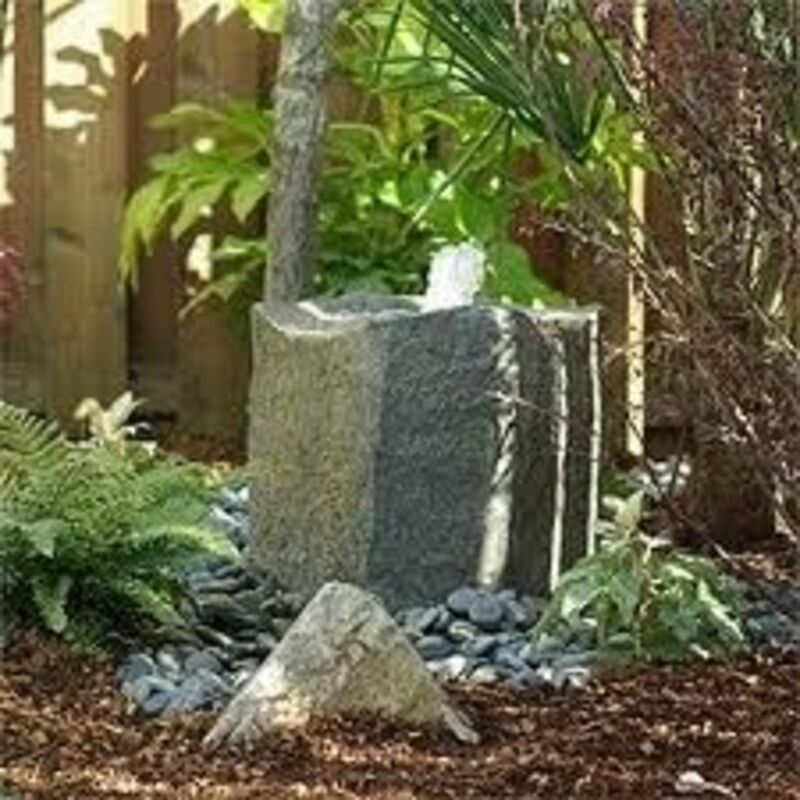 For anyone wanting to add a water feature but have no experience, I found this inexpensive option. 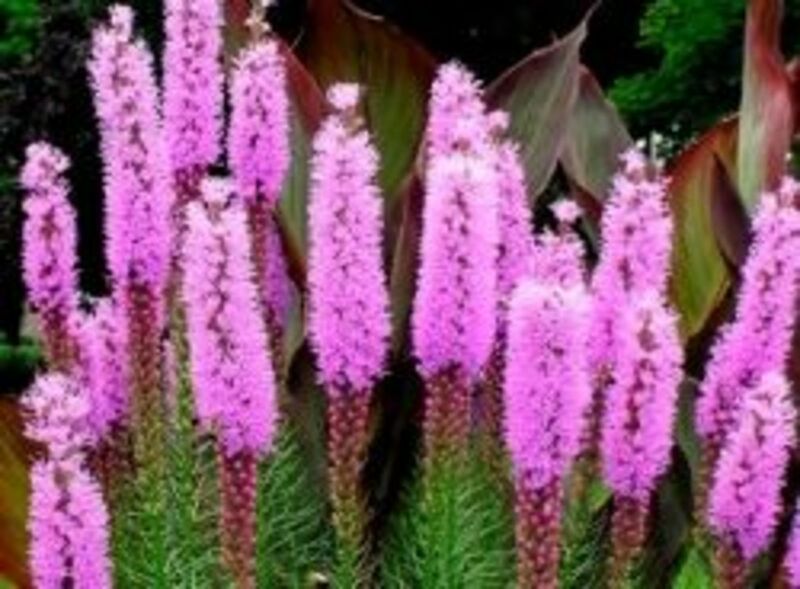 This can be an excellent choice for a small garden or learning what is required if you decide to upgrade at a later date. Excellent for the beginner or budget minded. 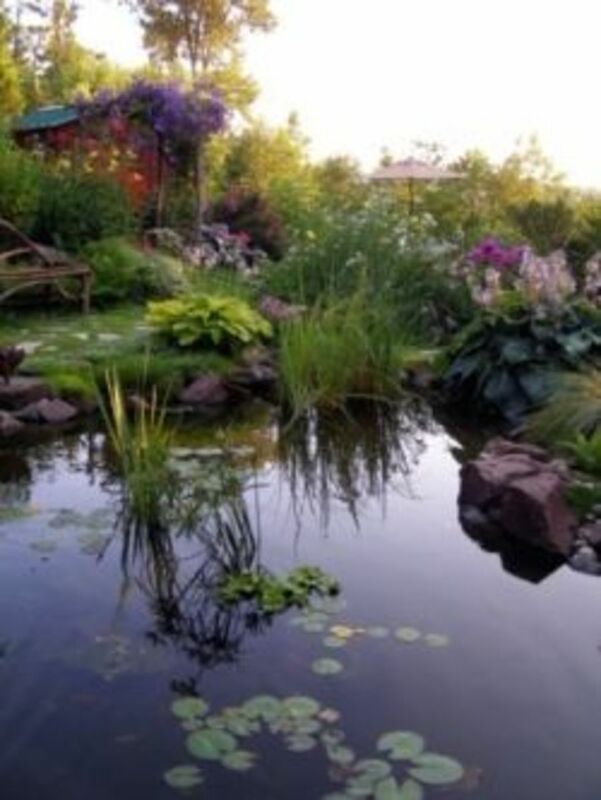 This is a complete kit to build a beautiful pond in your backyard! These are professional components that make building and maintaining this pond a breeze. Get the best!!!!! 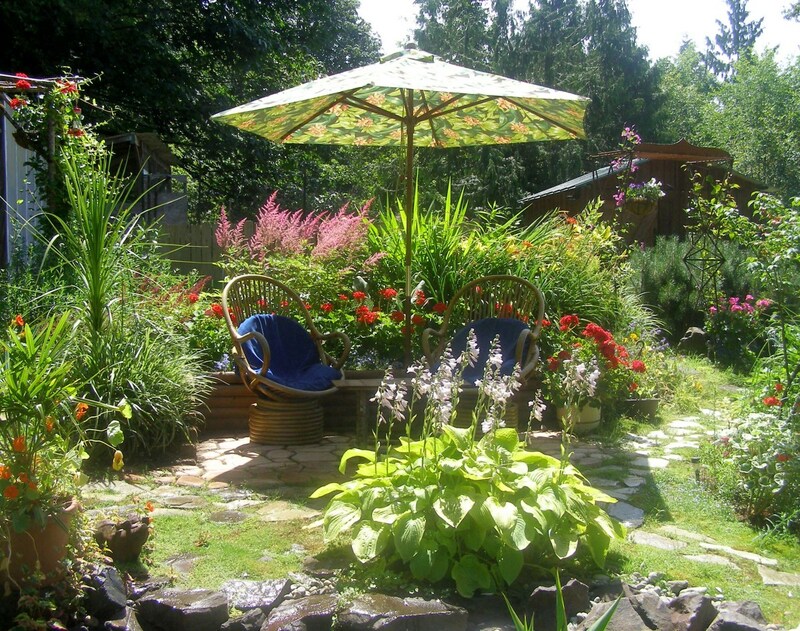 There are many books available that show you how to landscape, build ponds, and grow flowers. Of course you can search the internet for advice and peruse Youtube. Another great source of inspiration and ideas. This book is the greatest. Daniel Mack offers some great ideas for me. I use alder that is plentiful on my property and bends like willow when green. Something may spark an idea for your yard from this book. Love the info on the water features. Awesome! Thank you for the tips. Thank you so much Anita. The rocks stay together by gravity. Once you spin around the rocks and they find a place where they sit gravity takes over. It's been a long cold winter here in NW Washington, USA. However the rocks have remained in tact. I appreciated your comments. Hi Kittycheer, It really is amazing what you have achieved in your garden. As for your ponds, I don't think I could do that. I would need help. Love your rock balancing feature. I saw a video a while back with someone adding rocks on such a feature. It really is wonderful how they stay together and don't fall off. Which country are you from? 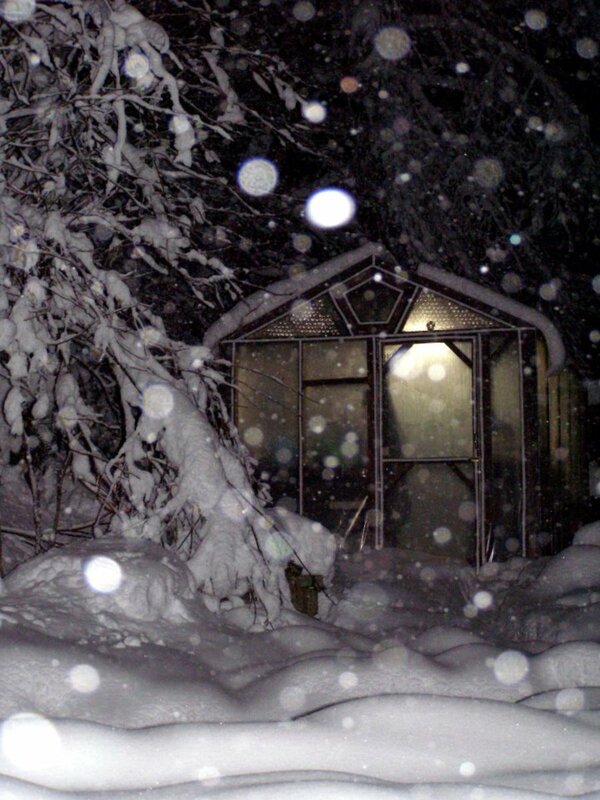 I love the images with the snow. What great ideas you have, our back yard is not too pretty, here in Texas get gets so hot and dry and they usually restrict watering your yard, I really love the ponds. Thanks for a lovely post! What a beautiful garden! 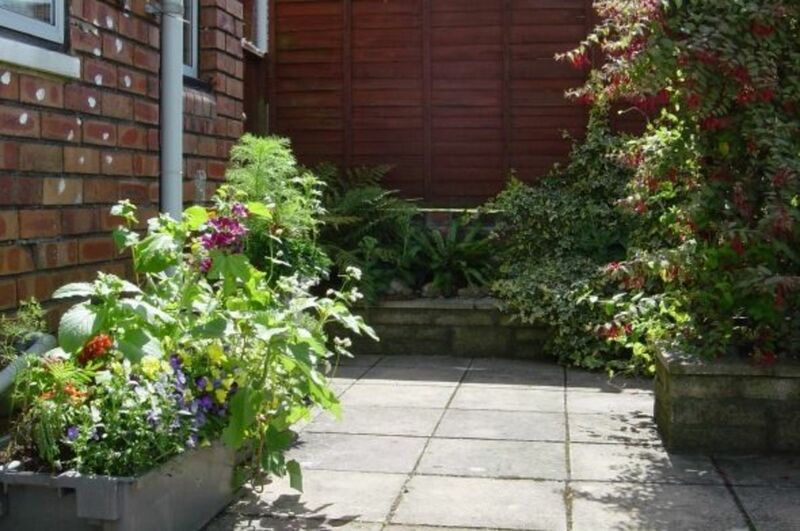 Thanks for sharing your garden ideas. This is very useful for me as I love gardening. Sorry for the long delay in responding. I find my banana tree does better just left in the ground through the winter and covering with leafs or mulch. 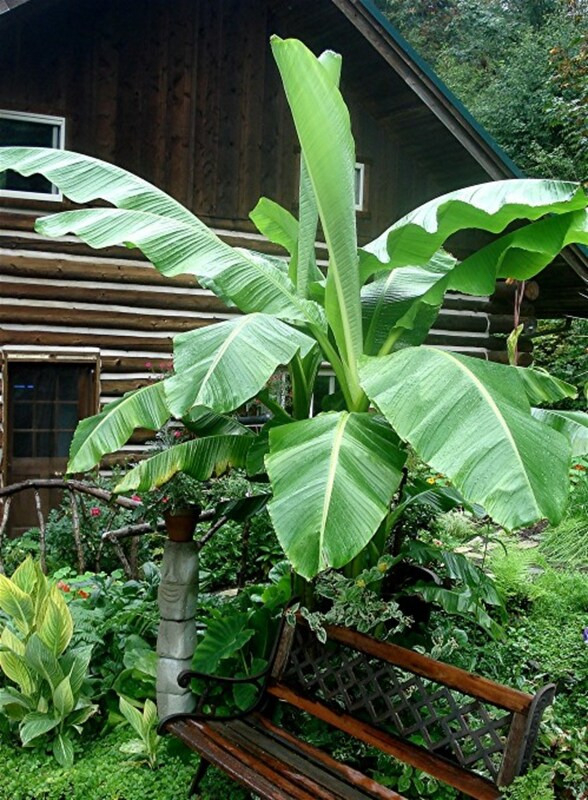 The hardy fiber banana tree (Musa basjoo) grows huge bright green leaves 6 feet long and 2 feet wide that split and fold over. Golden cream flowers appear in the summer followed by tiny inedible bananas full of seeds. The stem is 12 inches wide supporting a 15-foot-tall tree spreading 8 to 10 feet wide. In USDA plant hardiness zones 5 through 11, this banana grows 2 feet a week until reaching its mature height. Basjoo is the most cold tolerant of all the ornamental banana tree species; even if the top dies back during the winter, the roots will survive to grow again in the spring. Thank you so much Kelsey. It is my most favorite pastime. Very creative ideas. Upvote for being beautiful as well! Sorry for the delay in response Linnea. The purple vine is a clematis. However, since the trees have grown up around me it gets less sun than it needs so I have replaced it this year with a climbing rose. Hopefully it does better; I'll post photos here. Beautiful! What is the purple wine on the first pic? I absolutely love this! You have an amazing, gorgeous garden and your advice has inspired me to add a pond to my own garden. Thank you so much for this! P.S. Your cat looks so adorable! @ashleydpenn: Thank you so much. Each piece of wood is creative in itself. 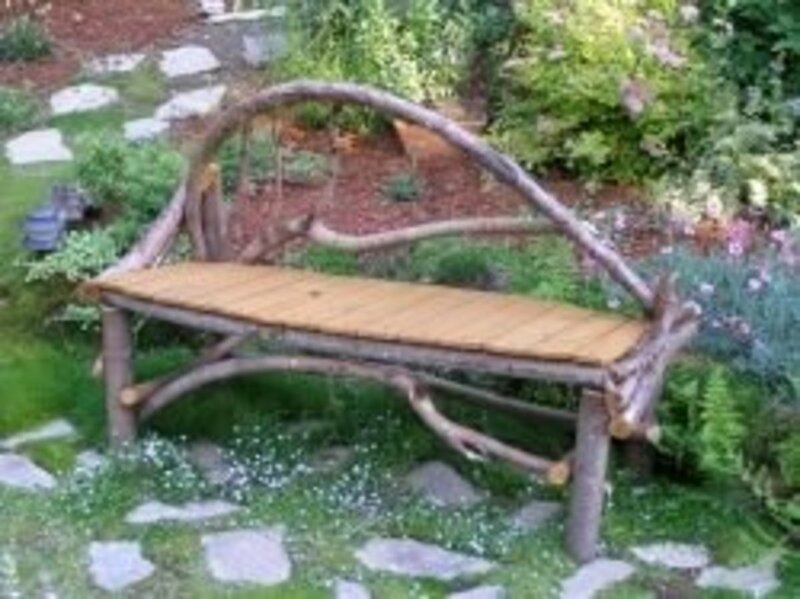 I really like your rustic wood bench! @TerriCarr: Thank you so much for your suggestions holisticwriter. I will definitely add more magazines and I am presently working on my own blog about designing your own hideaway. Hi Kittycheer, I thought I saw a note somewhere saying you are looking for more ways to monetize your lenses. You could add a number of gardening/cottage magazines in the Amazon module. They make such a relaxing pastime....these could appeal to people like me who don't want to invest the time and money to make such a yard but enjoy looking at them. Also, you mention doing landscaping for friends and family. Why not make a boutique small business offering your services. You probably don't need a storefront, just a website with great photos, a little advice/content and some testimonials from satisfied friends and family! You are obviously good at it so why not get paid for it? Very impressive! I second the motion for big picture modules on THIS lens. Though I will look at your other one too. Don't give us your address or many Squids will be stopping by for afternoon tea in the garden. 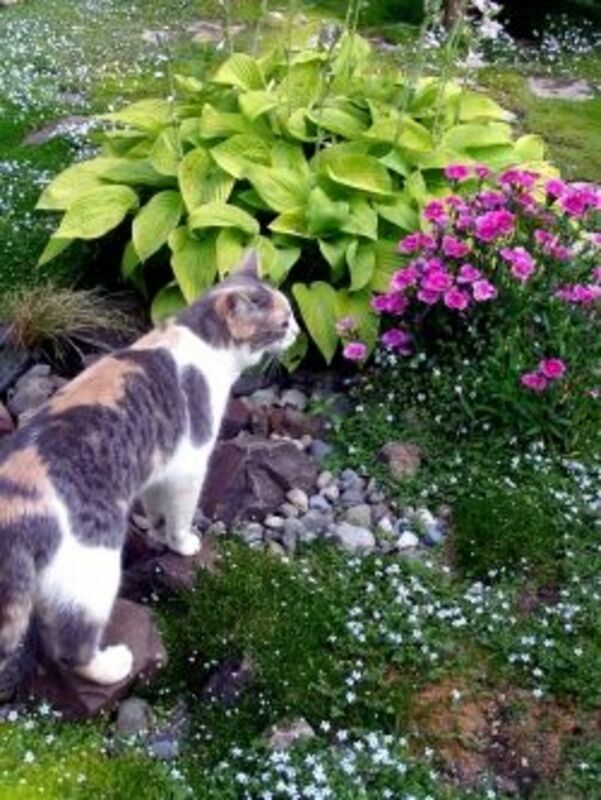 Oh, I love all your gardening ideas - especially the hand crafted furnishings and pond. @Lee Hansen: Thanks so much for your comment. After a long sabbatical I am working on my lens to make it more extensive. I'm also attempting to monetize it. Any suggestions? Love your lens! It'll appear on our Facebook page on Monday, March 17. Come and check it out! "The Green Thumb: A Place For Gardeners To Gather"
@MBurgess: Thanks so much RiaB. 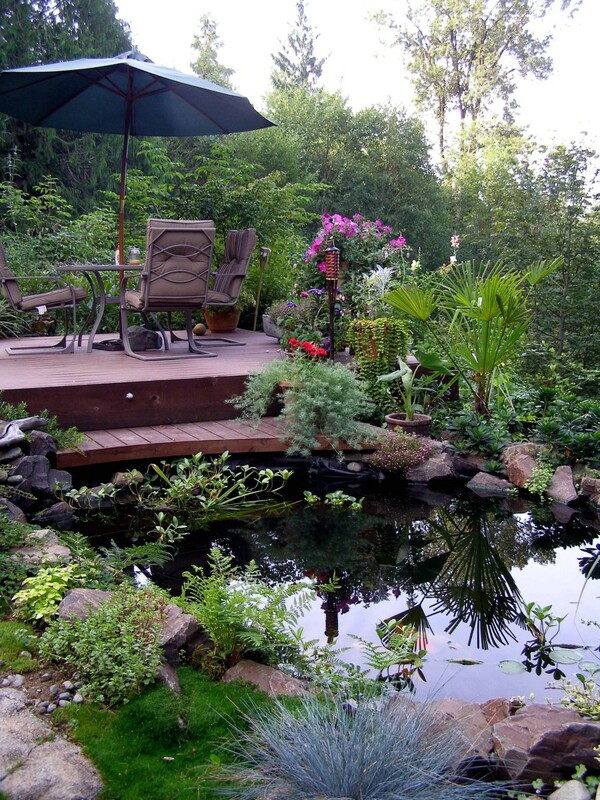 Check out the following lens for larger picture of other ponds I built for friends. I am SO jealous you have that yard! Your images are wonderful and very pleasing. I would love to see them in the Big Picture mode, especially the pond image. An awesome lens. Beautifully done. Thanks for sharing. Judy I love your garden. You are very creative. What is your climate? Some great ideas to work with on landscaping my backyard. Thank you for sharing! You've given me some ideas to improve my own yard! - if you can dig a stream so can I! Amazing stuff!! You do such beautiful work.